What Causes Shift Work Disorder? What Are The Symptoms Of Shift Work Disorder? How Does Shift Work Disorder Impact My Life? How Is Shift Work Disorder Diagnosed? How Can I Treat Shift Work Disorder? Is your work schedule interfering with your sleep? Working night shifts or on a rotation can quickly take a toll on both the quantity and quality of your sleep. If you’re struggling with extreme tiredness during your work shift, or can’t seem to fall asleep when you need to you may have shift work disorder. According to data collected by the Bureau of Labor Statistics, millions of Americans are considered shift workers. Doctors, nurses, police officers, construction workers, and truck drivers are among the 20% of US workers potentially at risk for developing shift work disorder. Shift Work Disorder is a circadian rhythm disorder that occurs when your work schedule forces you to be awake during times you would typically be asleep. The many debilitating symptoms experienced by those with this disorder come about due to a conflict between their internal body clock and their work schedule. While this disorder is usually experienced by people who work night shifts, those whose schedules require them to wake up before dawn or those who rotate between nights and days are also at risk. While most people will experience some difficulty adjusting to these type of work schedules, shift work disorder is a more serious and pervasive disruption of your sleep. Left untreated the symptoms dramatically impact your ability to perform in daily life and your health. Shift work disorder is caused by a disruption in the natural day-night cycle that is guided by your body’s internal clock: Your circadian rhythms. When this clock is out of sync with your daily activities it’s referred to as a circadian rhythm disorder. Your circadian rhythms are in charge of far more than just your sleeping habits — this internal clock brings about a variety of mental, physical and behavioral changes over the course of a day. Your heart rate, body temperature, blood pressure and the release of hormones are all regulated by this finely tuned timekeeper. Sunlight is the most powerful signal used by your circadian rhythms in order to determine what time of day it is. For this reason, the majority of people have an internal clock that roughly follow the same 24-hour cycle as that indicated by the rising and setting of the sun. When your shift-work schedule requires you to operate in a way that goes against this natural cycle a conflict arises. Your brain is receiving signals from the environment that it’s time to go to sleep, but you’re waking up to head to work. And vise versa: the bright sun indicates it’s time to wake up when you’re trying to fall asleep. Melatonin is a hormone that sets of a series of biological changes which prepare your body for sleep. Under the direction of your circadian rhythms, the release of melatonin is primarily guided by sunlight — increasing as darkness approaches, peaking in the middle of the night, and gradually depleting towards morning when it’s time to awaken. 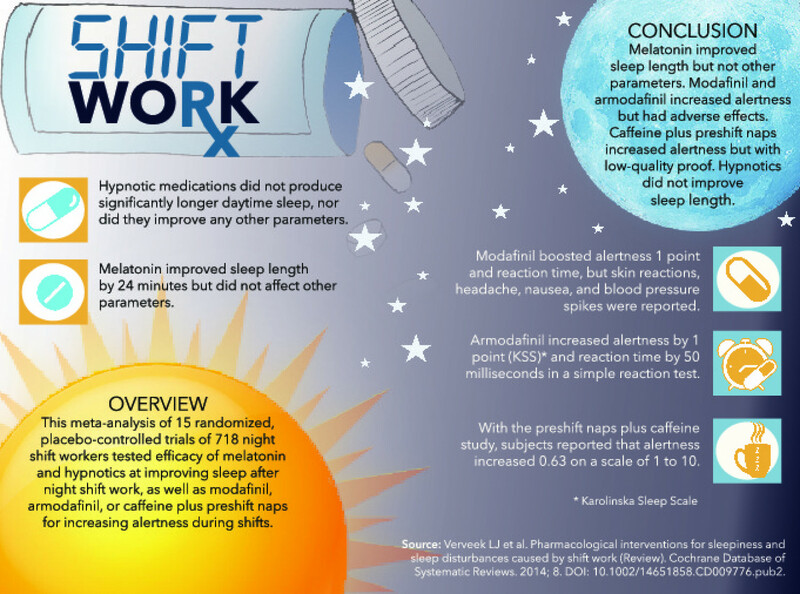 When you have shift work disorder, your body may be making melatonin when you actually need to be awake for your job. Then, when you are preparing to go to bed, your melatonin levels are too low to promote sleep. Excessive daytime sleepiness (EDS)EDS is much more than the usual dips in energy we normally experience throughout the day. You may feel so exhausted during your waking hours that you have to actively fight off the urge to sleep. At its most extreme it results in another symptom of shift work disorder: microsleep. Episodes of microsleepMicrosleep is the term used to describe a very involuntary occurrence of sleep that lasts for only a few seconds. The episode may be so short that you are not aware of having fallen asleep at all. Microsleep can be very dangerous depending on what activities you are performing at the time the episode occurs. If your job involves driving or operating other heavy machinery this could result in fatal accidents. InsomniaWhen your schedule is not in sync with your body clock you may have difficulty going to sleep when you need to. You may also find that you wake up after only a few hours of sleep and struggle to get sufficient rest when you’re able to. Waking up feeling unrefreshedEven if you are sleeping the recommended 7-8 hours per day, you may still find yourself feeling unrefreshed upon awakening. Shift work disorder can cause a disturbance in your sleep cycles, meaning you don’t get the needed amount of each stage of sleep. Lack of energyYou may find you do not have the energy to complete even the most minimal tasks. Anything from performing your duties at work to the simple act of showering can feel extremely draining. Mood swings and irritabilityOne of the most prevalent symptoms of sleep deprivation is an inability to regulate your mood, often resulting in irritability. Over time, if you aren’t able to correct your sleep debt, you could develop symptoms of depression and anxiety. Difficulty with concentration and memoryWithout adequate sleep your brain cannot function at full capacity. This can cause you to experience difficulty with remaining alert and concentrating on what you’re doing.Countless studies have demonstrated the integral role sleep plays in memory consolidation. Additionally, if you’re unable to concentrate then you may not even be collecting enough material to deliver to memory storage in the first place. The effects of shift work disorder go far beyond just your sleep, dramatically reducing your overall quality of life. From work to your interpersonal relationships your symptoms can interfere with your ability to function on a day-to-day basis. Furthermore, studies have shown that shift workers have a higher risk of developing a variety of health problems. When you first start working your new shift the sudden disruption of your circadian rhythms will cause you to experience similar symptoms as those associated with pulling an all-nighter and jet lag. It’s believed that these health risks may be attributed to a decrease in production of the hormone melatonin. Often referred to as “the sleep hormone,” melatonin is essential for proper regulation or your circadian rhythms and sleep-wake cycles. Additionally, melatonin plays a role in your immune function – – helping to fight of infections and protect against other health problems including cancer. Keep in mind that if you just switched to your new schedule it’s normal to have some trouble sleeping at first. However, if after a few weeks your symptoms continue and cause significant disruption to your ability to function you may have shift work disorder. At this point you should make an appointment to discuss your condition with your doctor. Shift work disorder is diagnosed by examining your sleep patterns and your coinciding symptoms. Your doctor will also perform tests to rule out any other potential cause of your problems, such as an underlying medical condition or another sleep disorder. You may be instructed to complete a sleep journal in which you record when you sleep, how much you sleep, and how you feel when you’re awake. If another sleep disorder is suspected, you may have to complete a sleep study. An actigraph is a device worn on your wrist that monitors your movements and exposure to sunlight. Your doctor will use this data to determine your sleeping patterns, including your sleep-wake schedule and daytime sleepiness levels. This serves as an objective measure in support of your self-reported symptoms that can help guide your treatment. Sleep studies are typically not used in the diagnosis of shift work disorder, but your doctor may order them to rule out other disorders. The two most common studies done are in-lab sleep studies (polysomnography) and the multiple sleep latency test (MSLT). Polysomnography requires an overnight visit to a sleep lab, during which a variety of measures will be taken, such as heart rate, oxygen level, brain waves and breathing. This is the most comprehensive sleep test and is used to diagnose many sleep disorders, including narcolepsy and sleep apnea. The MSLT is an at-home test where you’ll be asked to take 5 naps at equal intervals throughout the day. The amount of time it takes you to fall asleep is measured and used to determine your level of daytime sleepiness. 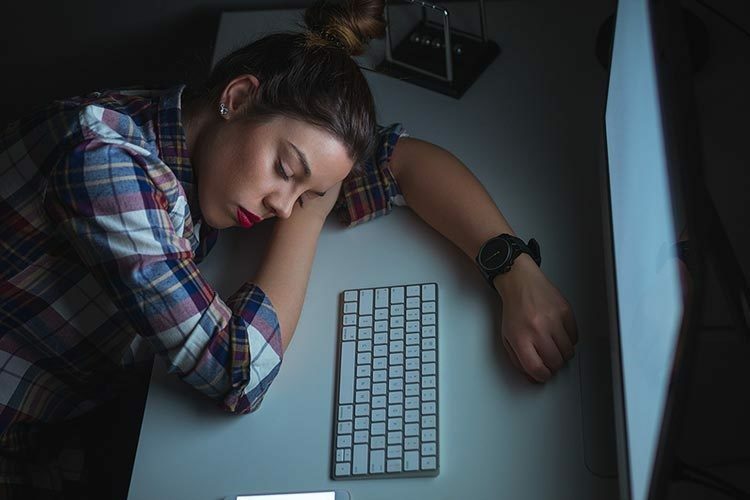 While not everyone encounters significant sleep disruption when their work schedules force them to be awake at abnormal hours, research indicates that our bodies may simply be unable to fully adjust to the demands of shift work. Obviously the most effective way to treat shift work disorder is to switch your work schedule; however, that’s usually not a viable option for most people. Thankfully there are ways to improve the quality of your sleep and decrease the severity of your symptoms. Ensure that your sleep environment is very dark by blocking out the sun using thick drapes or an eye mask. You may even want to cover up any other sources of light in your room, such as digital clocks. Wearing wraparound sunglasses on your drive home from work in the morning can reduce the sunlight entering your eyes signaling that it’s morning. While coffee and energy drinks can help you wake up for an evening shift, you should not have any caffeine for at least 5 hours prior to your intended bedtime. During the day the amount of noises that could potentially disturb your sleep increases dramatically: from increased traffic on roads, kids playing outside to the sound of the other members of your household going about their day. Wear earplugs or use a white noise machine to help block out any sounds you cannot avoid. Even if these noises are not waking you up they could still be disrupting your sleep cycles. Our circadian rhythms naturally lower our body temperature when it’s time to sleep. Keeping your bedroom around 65 F (18 C) has been proven to help promote sleep. However, being too cold is also counterproductive so adjust your thermostat as needed. While alcohol can help you feel sleepy it has a secondary effect of altering your sleep cycles. Specifically, alcohol lowers the amount of REM sleep you have which can contribute to waking up feeling unrested. Try to keep the same sleep-wake schedule on your days off as those during the work week. While it’s tempting to want to switch your sleep times around in order to enjoy time with friends and family this will make it almost impossible to adapt your circadian rhythms to your work needs. Napping may be essential for you to maintain your alertness throughout your shift, especially if you are suffering from excessive daytime sleepiness. A short nap of only for 20-30 minutes can help refresh you and boost your cognitive functioning, reducing the risk of microsleep or having an accident on the job. 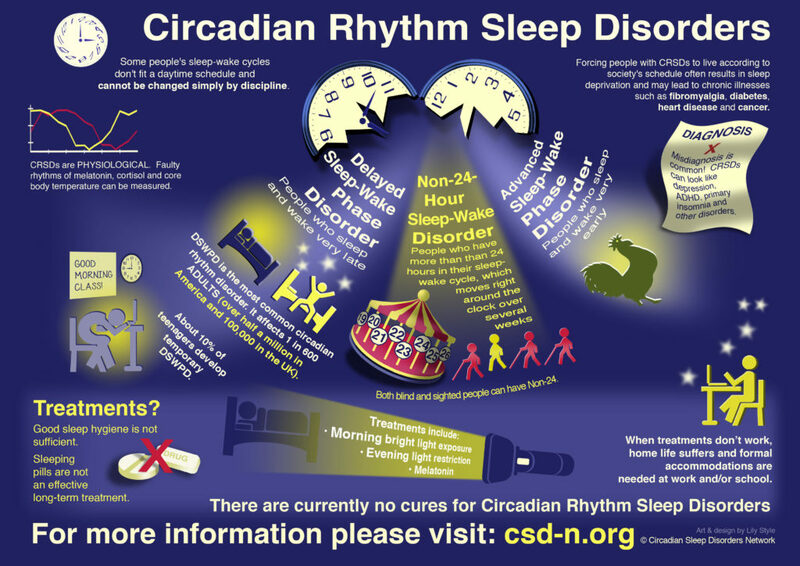 Bright light therapy is used to treat a variety of sleep disorders, but can be particularly powerful in reducing the symptoms of circadian rhythm disorders. It involves exposure to a specialized light that simulates sunlight during specific times that reinforces your desired sleep-wake schedule. Light therapy devices come in several varieties: Boxes, lamps and visors. Schedule in a short session when you first wake up, then again when you take your mid-shift break for the greatest benefit. You may also want to purchase a dawn simulator for your bedroom. These can be programmed to gradually brighten a room to mimic the rise of the sun at dawn and have been proven to help in the process of waking up. Medical sleep aids can be effective in helping you adjust to your new sleep schedule in the short term. However, when taken over an extended period of time these medications may become less effective, requiring you to take higher and higher doses. You may also become dependent on them to sleep. You should talk to your doctor before taking sleeping pills. They will be able to prescribe you one that will not conflict with any other medications you take, and can help you address any unwanted side effects. If you are having particular difficulty staying alert at work or experience excessive daytime sleepiness, your doctor may prescribe you modafinil. This medication is designed to promote wakefulness and is often used in the treatment of narcolepsy. Taking melatonin can help you to adapt to your shift work schedule. You can purchase these supplements at your drugstore, and you should be taken approximately one hour before bedtime. Unlike sleeping pills, melatonin supplements are not associated with any significant side effects and are a natural way natural way to signal to your body that it’s time to sleep. Working rotating shifts pose unique issue when it comes to treatment as you can’t simply trick your body into adjusting to a new schedule if it’s constantly fluctuating. However, you can decrease the impact of switching your sleep times by asking your manager for a clockwise rotation — so that your new start time will be later than your last one.It’s much easier to go to bed later than to try and force yourself to fall asleep at an earlier time. If it’s possible, having someone else pick you up after work or take public transportation. Drowsy driving can be just as dangerous as driving while under the influence, so it’s best to avoid getting behind the wheel when you’re exhausted. Prepare yourself for a change in your sleep-wake schedule by slowly adjusting your bedtime in the days prior to starting. This will help to gently nudge your circadian rhythms in the right direction, rather than shocking your system with a drastically different schedule.